Navigation gets you from where you are to where you want to be. Speaking of navigation, you can jump to selected sections of this post: Navigation; R-bloggers; Task views; Rdocumentation.org; sos package; ?? ; apropos; ls; methods; getAnywhere; :::; find; args; grep; %in%; str; getwd; file.choose; Spyglass summary; browser; See also. The items can be packages, or files of R objects (created, for example, via the save function and put on the search list with attach). It is almost a true statement that R searches for objects in the order of the search list — first in the global environment, then in whatever is second on the search list, and so on. There are reasons to dislike each of these — require fails to throw an error if the package is not available, while library conflates both terminology and operations. 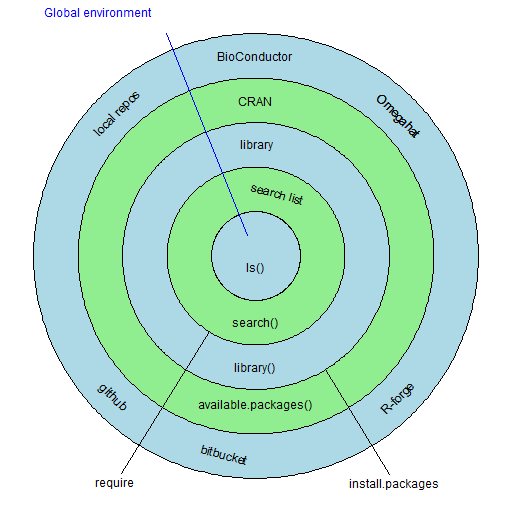 CRAN is the primary repository, but not the only one. You can even create your own. If you’re not so sure where you want to go, then having a glance through R-bloggers might give you some hints for vacation spots. Suppose you are starting on the Iberian peninsula and you want to get to India. How to do that? You can go south and then east when you can, like they’ve done for a while now. Or you can go west instead. 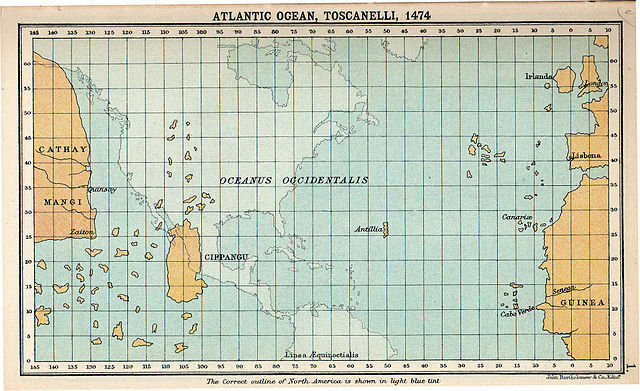 “Atlantic Ocean, Toscanelli, 1474” by Bartholomew, J. G. – A literary and historical atlas of America, by Bartholomew, J. G.. Licensed under Public domain via Wikimedia Commons. 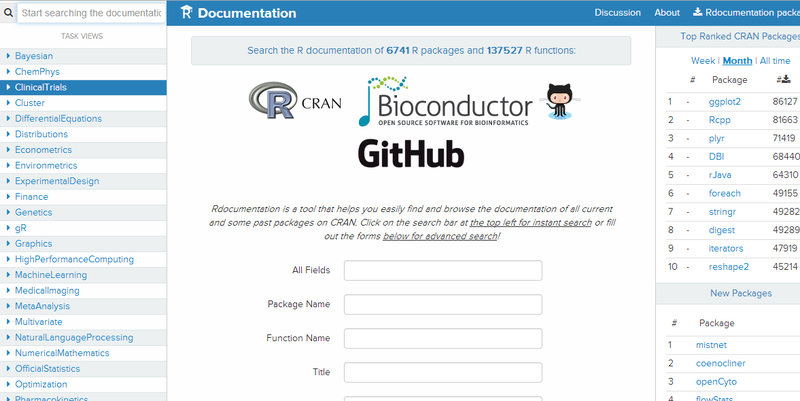 Rdocumentation gathers help files from lots of places and makes them searchable. You can find functionality from the wide world of R here. Easily. Note that just because you don’t find what you are looking for, doesn’t mean that it doesn’t exist. When the name of the strsplit function recently escaped me, I failed to find it here (because I didn’t know the right words to put in the search). If you come up empty, there is always internet search (but see below). srch <- ??? "genetic optimization algorithm"
The ??? operator is an alias for the findFn function. There’s more information in the R Journal article. produces a list of help files on the search list that contain the term (“find” in this case) in appropriate sections. The ?? operator is an alias for the help.search function. The result is a vector of function names that contain the phrase. This only looks at objects that are on the search list. which (when at the R prompt) lists the objects that are in the global environment — the first position on the search list. Another useful argument is pattern, which in my laziness I usually abbreviate to pat. The pattern argument restricts the output to objects with names that partially match it — a sort of local apropos. The all.names argument to ls defaults to FALSE. When it is TRUE, then objects whose names start with a dot are also printed. As already noted, ls and objects are synonyms. “Columbus Fleet 1893 Issue” by US Post Office – US Post Office /Hi-res scan of stamp from private collection by Gwillhickers. Licensed under Public domain via Wikimedia Commons. R’s object-orientation (generic functions and methods) simplifies naive use, but can produce some grief for the semi-naive. A generic function (examples are print, plot and summary) has methods specific to the class of the object given as the argument to the function (generally the first argument). methods is for S3 methods. Similar functionality is available for S4 methods with showMethods. standardGeneric for "print" defined from package "base"
Use showMethods("print") for currently available ones. You may have noticed that the results of methods includes the phrase “Non-visible functions are asterisked”. The ocean has a subsurface containing things that are not easily visible. So does R.
Packages typically make a few functions visible, but functions that are not of general interest are left invisible. The visible objects are exported. shows you the definition of the function and explains where it found it. "registered S3 method for predict from namespace stats"
> predict.poly <- "want cracker"
What’s going on? There should be two things by the name, but this is saying we don’t have any now. Think of this as giving the family name in front and the given name at the back. In this form both R and you know that the function lives in the pinta package (actually what you know is that it lives in the pinta namespace, but close enough). produces the help file for the find function. And if sos isn’t on the search list, it’s even better with its amusing (and wrong) suggestion of what to try. The ? operator is an alias for the help function. The latter is often the case (probably too often) for functions written locally. If a function has a zillion arguments, then it can be hard to find the argument that you care about in the results of args. There’s a solution for that too. The last command uses the exact argument to subscripting to say that it is allowable to give an abbreviation. By default the result of grep is the indices of the strings that match rather than the strings themselves — hence value=TRUE in the call. If instead of partial matches, you want exact matches, then %in% returns a logical vector stating if the corresponding element of the first vector is an element of the second. %in% uses match which can perform all sorts of magic. It is popular understanding that Columbus was the first to go west to get to India because of the then belief that the earth is flat. It was Washington Irving in 1828 who spread that idea. Actually Columbus was first because others thought — correctly — that India was too far away going west. One reason that R is good at what it does is its richness of data structures. str produces a map of an R object. says it is a length 100 vector ([1:100]) of integers (int), and lists the first few values. says that it is a matrix with 2 rows and 3 columns ([1:2, 1:3]) of numeric values (num), and lists all the values. chr [1:2, 1:3] "1" "2" "3" "4" "5" "6"
..$ : chr [1:2] "r1" "r2"
The first line says it is a matrix with 2 rows and 3 columns ([1:2, 1:3]) of character values (chr), and lists the values. The second line says that the object has an attribute called “dimnames” that is a list of length 2. The third and fourth lines give the two components of dimnames. The first component is a character vector of length 2, and the second component is NULL. The first line says that it is a data frame with 2 rows and 3 columns. Each of the remaining lines gives the name of the column and its contents. str is useful enough to count twice. Change the working directory with setwd. It is not at all unusual for me to need to specify a file name but R and I disagree — that is, what I specify doesn’t exist. Rather than fixing my mess, it is often easier to use file.choose to print out the path and then paste the result to where I want. which gives you a popup window to select the file. The result is a character string. Table 1 attempts to summarize how to find things in R, though some of the pegs don’t quite fit their holes. For example, the line for global environment could apply to any item on the search list. search list apropos (name) find (location) ?? The Santa Maria ran aground and met its end on Christmas Day 1492. Bad things happen — even to brave explorers. at strategic spots in the function. to see the names of the objects in the frame. The difference is that recover allows you to look not only inside the frame of the function in which it was called, but in the frames of the chain of functions that led to the call. If you put the call to recover in function foo, and foo was called by funB which was called by funA, then you can look in the frames of foo, funB and funA. In this case you are given a numbered menu and you select the number you want, or 0 to exit. Once you’ve selected a number, it is just like being in browser. If you say “c” to end the browser session, then you get back to the menu. The R Inferno charts quite a few rocks that you might run aground upon. An important tool to get around in R is to have a hacking attitude — to try things with the idea that they probably won’t work. With enough hacking you might even do a columbus — have a great result for the wrong reason. If you’re looking for spice and you find gold, don’t ignore it. An introduction to R is “Impatient R”. Pertinent chapters of Tao Te Programming include: profit from mistakes (Ch. 11), hacking (Ch. 18). The Wikipedia article on Columbus fails to paint him as the heroic figure I was taught in elementary school. I wonder which is more accurate. The sessionInfo function tells you a variety of information about the current state of your session. Not least is the versions of the packages that you are using. How sad I am that I did not discover the R Inferno, and your blog, whilst still in graduate school, when it truly could have been a salve to my suffering. Now it is still a great comfort, but to much lesser angst. Thank you for your work on this subject. Thanks for the kind words. I’m open to ideas of how to make “The R Inferno” better known. It seems there are a lot of people suffering without it when they could be suffering with it. You are most welcome for the well-deserved appreciation. I wish I knew how to make things well known. It would be very helpful in my field. But alas, I’m stuck in my circle of nerds on the Internet. I might forward it to my old professor at the UW who teaches some of the intro classes. Maybe she will put it on her syllabus.